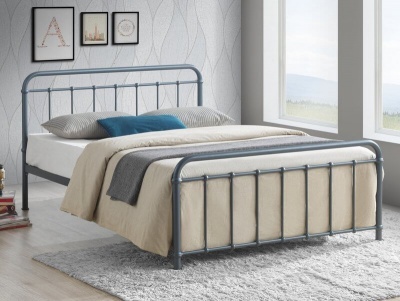 Give your bedroom a stylish look with this modern bed frame. Bright aluminium head and foot-boards contrast with the hardwood legs beautifully. 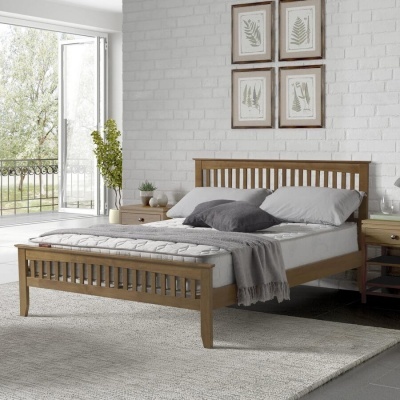 Sprung slatted base provides you with extra comfort and prolongs the life of your mattress. Fits a standard double 135 x 190 cm mattress. Choose the bed frame only or with a Deluxe or Elite mattress. Deluxe: Semi orthopaedic comfort mattress. 13.5 gauge bonnell spring unit, side edge supports, 900 gsm spring insulator pad, 600 gsm polyester filling, quilted Belgium damask cover with quilted air vents. Depth 23 cm. Elite: A 1000 pocket spring unit with a hand tufted luxury damask cover with quilted boarder and air vents to increase air flow and breathability. 1000 gsm spring insulator pad, 800 gsm polyester filing. Depth 25 cm. Both of the mattress have been made in the UK. Metal parts are constructed from power coated steel. Flat packed for home assembly, full instructions included.